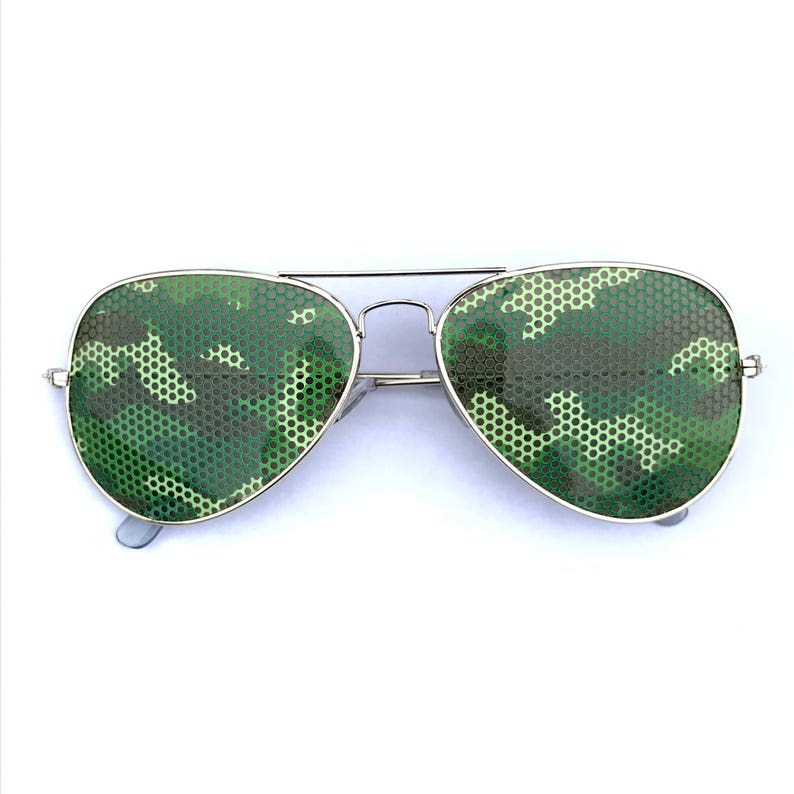 - These glasses are made with perforated vinyl decals over UV protected lenses and metal frames. - Unisex adult size (fits 12 years old and up). - The perforated see-through lens design may obscure vision at first. - Frame options & lens options: frames come in black & gold; lenses come in polarized, clear, & tinted. - Tinted lenses display the graphic better, however, clear lenses are easier to see through at night - choose wisely! - Round Lennon-style frames come in random colors of black, silver, and gold - you may specify your preferred color but I cannot guarantee stock. These sunglasses come with clear lenses only. - Heart-shaped frames only come in gold. - Wayfarer frames only come in black plastic. - Production: 3 to 5 business days. - Your items will be shipped with USPS Mail 1st class & take 3 to 5 days for delivery. - Wholesale orders may need an additional 5 days to replenish stock. - Orders can be completed in as little as one day if my schedule permits it. If there is some kind of deadline please let me know and I'll try to accommodate you. Bulk & Wholesale deals are available and if you can't find a design you like on the frames you want, just ask me. Please ask any questions you might have BEFORE placing your order, thank you! Thank you! Super fast shipping and fun product! I accept payment by credit card and through PayPal; real simple like that. All payment is expected at the time of order placement unless otherwise agreed upon on a case-by-case basis. If your item(s) arrive damaged in any way I will replace or refund it(them). If curious, please inquire about the colors or quality of the item in any way before ordering. My third-party drop-shipper will replace or provide refunds only for defective prints or a wrong item sent. As always, they guarantee their print quality and would be happy to provide a refund or exchange due to printing errors but otherwise, all sales are final. * If the package is under 10 ounces I'll ship it within 3 days via first class USPS, often faster. * All Pins and Sunglasses will always bubble-wrapped. * As of now, my clothing (T-Shirts, Kid's Clothing, Women's Clothing, and Hoodies) is made in partnership with a drop-shipper and cannot be packaged and shipped with my Pins, Sunglasses, and other handmade products. IMPORTANT: If you have questions about shipping times please ask me BEFORE you place your order. Thank you! Custom orders: I will consider custom orders for some of my products on a case-by-case basis depending on my ability to produce the product as requested and within the time-frame as requested. Please inquire! Wholesale orders: I may offer wholesale pricing for some of my products, such as Sunglasses. Please message me via Etsy with any questions and inquiries for more detail!